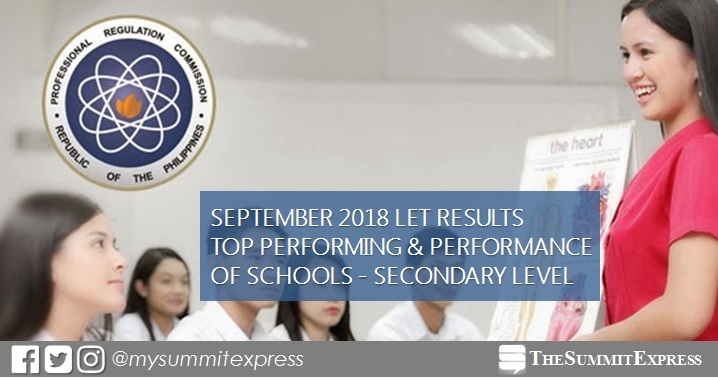 MANILA, Philippines – The Professional Regulation Commission (PRC) named the top performing schools in the September 2018 Licensure Exam for Teachers (LET) also known as Teachers board exam for Secondary level. Results are out on Friday, December 7 or in 47 working days after the exam. PRC conducted the September 30, 2018 LET simultaneously in at least 25 testing centers in the country. PRC hailed University of the Philippines - Diliman (UPD) as the top performing school in the September 2016 LET Secondary level, 96.84% or 92 out of 95 passed the exams. It was followed by De La Salle University (DLSU) - Lipa with 91.38% or 53 out of 58 passed. In the September 2015 exams, UST topped the schools with 94.92% (168 out of 177). Philippine Normal University (PNU) - Manila ranked second with 91.79% or 660 out of 719 passed.